​With the record-setting rainfall we’ve seen over the past month, flooding of fields is very widespread (Figure 1). 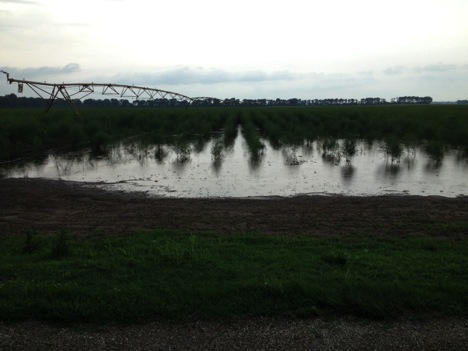 Fields that have experienced flooding present growers with difficult management choices. Flooding is defined (per FDA) as the “flowing or overflowing of a field with water outside a grower’s control.” Flooding is associated with streams, creeks, or ponds that overflow their banks and cannot be controlled. The FDA considers food contacted by flood water to be “adulterated” and not fit for human consumption. Due to microbial and other concerns, produce cannot be harvested and sold into the public food supply once it contacts flood water. Document the extent of flooding with photos and markers in the field. This will ensure that the flooded area remains defined once flood waters have receded. Photos will also help other involved parties (e.g. insurance adjusters, third-party auditors) to understand the extent of the issue. 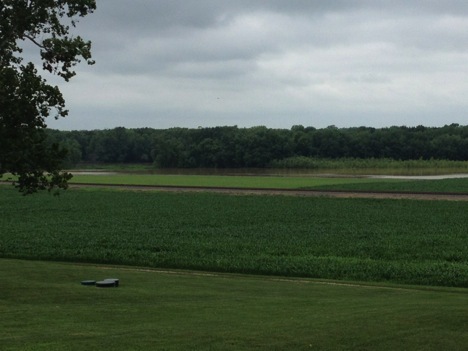 Define a buffer zone beyond the flooded area where no produce will be harvested. It is recommended that the area be at least 30 ft. This will help to reduce the risk of cross contamination of splashing from overhead irrigation or additional rainfall. If at all possible, avoid traveling through the flooded area to access the field. This helps to ensure that microbes don’t hitch a ride into the harvestable area on boots, shoes, or tires. Wear boots and gloves while working in flooded areas. Be sure to clean them thoroughly before entering the unaffected areas. Any equipment that is used in flooded areas should be thoroughly cleaned prior to entering unaffected areas. Ideally, equipment should be used in unaffected areas first, and flooded areas last. In those cases where flooding occurs in or near the crop but does not contact the edible portion of the crop, FDA guidance states that growers should, “Evaluate on a case-by-case basis for the likelihood of contamination.” If crops have been exposed to flood water, growers may want to consider testing for pathogens, mycotoxins, PCB’s, heavy metals, pesticides, or other contaminants. Growers should also remember that these tests are not definitive. Because we can’t test every ounce of soil and, by necessity, use representative samples, there is always the chance for a “false negative.” Before investing in expensive tests, growers are encouraged to seek technical advice. More common than flooding is ponding or pooling (Figure 2). Pooled water generally accumulates in lower areas of the field or between rows, especially if raised beds are used. The key distinction between flood water and pooled water is that flood water originates from an uncontrollable source such as a river or creek. Standing water that originated from a river or creek would still be considered flood water. Pooled water can cause damage to crops, and if it remains for an extended period of time can increase the risk of contamination, but is generally not considered to introduce as much risk of contamination as flood water. In the case of pooled water, growers should consider whether or not the water is contacting the edible portion of the crop, how long the water was pooled, previous soil amendments, and whether or not the pooled water resulted in increased wildlife activity in or near the affected area. Flooding and pooling in fields can cause additional food safety challenges and have the potential to introduce additional risk into the production system. However, with proper management, many of these risks can be mitigated. Figure 1. Flooding in a field. Figure 2. Pooling of water.